King Jehan de la Marche, wearing the ancient crown of the East. The crown had a Velcro attachment so it could be resized for each wearer. The Gazette asked Count Jehan de la Marche, eighth King of the East, for memories of some of his early SCA experiences. This is the second installment he sent, which covered his memories of his reign. The next event I recall was my coronation, which was also the next Crown Tourney, which was supposed to be the tradition at the time, though observed irregularly. (I believe it fell in late September or early October 1972.) It was held on a site in Beyond the Mountain which was basically an unmown field –the owner of the site had told the autocrat that it would be mowed in advance of the event, but it was not, so the field was covered in grass two or three feet high. Oddly enough, I have no distinct recollection of the moment that Cariadoc put the crown on my head, though I know the ceremony was very simple by later standards. I believe we used a version of the Archenlandish oath from C. S. Lewis’s The Horse and His Boy (”This is what it means to be a king: to be first in every desperate attack and last in every desperate retreat, and when there’s famine in the land, as must be sometimes, to wear finer clothes and laugh louder over a scantier meal than any man in your kingdom.”) However, that belief is based on what I recall of the practice of the time, not direct memory of hearing it. The one moment I distinctly recall is that when I kissed my queen after crowning her, her crown fell off. There was also the episode of the Queen’s Piper. Sometime before the coronation, I was walking through Wolsey Hall at Yale and heard a man playing a bagpipe alone in an empty auditorium. I had invited him to the coronation, and since there was already a King’s Piper (Sir Eyolf) I appointed this one (whose name I do not recall), the Queen’s Piper, whereupon Lauryon said “All right, now play.” Someone said “The queen has issued her first command,” and he played. I recall asking Duke Cariadoc and Duke Akbar to serve as my guards. We had a lot of byplay in those days over our personas’ religions (nowadays it might be more sensitive). I said approximately that although I was a Christian king I had found Saracen dukes very reliable. There was a very small crown tourney –I believe there were five fighters entered (the minimum under SCA law at the time) and I asked Duke Akbar to enter so we would have even numbers for the first round. He did and ended by winning the crown, defeating Sir Finnvarr de Taahe, who had lately moved to the East from the Middle Kingdom (Barony of North Woods). The next event I recall was a tourney in the Barony of Myrkwood (Baltimore), then led by Begum Sita of Oudh. The main point I remember was the tourney destroyed four swords (all those available in the barony at the time). I believe Middle-trained fighters tended to hit harder than Eastern ones (on average) –there were some exceptions, such as Shlomo and Garanhir. Sir Finnvarr and I met in the final, and I won. I believe one of the other fighters was Alain du Rocher. During my reign, I did issue the first code of laws for the East Kingdom, all or nearly all of which have since been superseded. They included an attempt to have a representative of the Crown in each group to encourage communication –which was never implemented –and a law advocating (as it could not be required) that subjects who could not attend the wars should contribute to the costs of those who served (scutage). Although this was never enforceable, and has not been law for many years, I was told lately that one lady in the East still abided by it and contributed to her friends’ costs of going to war. My recollection is that I circulated these laws by postal mail (there being no email in those days) rather than discussing them in a live council. I also reorganized the kingdom order of merit – as I understand the situation (it was before my time), Duke Akbar in one of his earlier reigns had created the Order of the Silver Crescent, and then Shogun Rakkurai had created an equivalent Order of the Golden Dragon . I merged the two orders into the one Order of the Silver Crescent (all members of the Golden Dragon becoming members of the SIlver Crescent). At that time, I believe that order was the only order beneath peerage level in the kingdom. The last major event of my reign was Twelfth Night held in the Barony of Myrkwood. My queen Lauryon was unable to attend due to illness, and so I asked Countess Abrizhade al-Medina O.L. (who had been queen to Franz von Blickend-Lichten, second king of the Middle) to serve as my ceremonial consort, which she graciously did. The guests at the event included members of the Maryland Medieval Mercenary Militia (later Markland) who contributed considerably to the liveliness of the occasion. Two of them staged a mock dagger fight (with steel daggers) and rolled around my feet as I was sitting at the feast. There was also an episode I never fully understood in which I remarked my drink tasted odd and one of the MMMM shouted “The king has been poisoned.” I am not sure whether someone had actually put something in the drink or it was just an improvised response. More seriously, I did (as I mentioned before) knight Asbjorn the Fairhaired, chiefly for his valor at the First Pennsic War. Since he was squire to Duke (at the time Prince) Akbar, I asked Akbar if he would prefer to actually dub Asbjorn, but he replied that he wished me to do it, so I did. This was the only peerage granted in my reign. Afterward I did crown Akbar as king (his third and last reign), and his lady Duchess Khadijah was crowned queen. Oddly enough, I do not recall the ceremony at all. There was no ceremony making me a count –I think the title was only developed a little later, though Atenveldt had Crown Barons and I believe Franz von Blickend-Lichten had been made a baron after serving as king of the Middle. 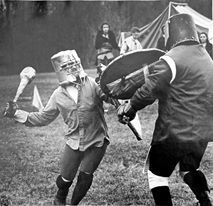 Count Jehan fighting in a Freon can helm, soft basketball elbow and knee pads, and hockey gloves. He is using a mace nicknamed “Feather” which was made by Duke Andrew of Seldom Rest from a hickory axe handle and a roll of toilet paper plus lots of tape. It weighed between 4.5 and 5 pounds. The Gazette asked Count Jehan de la Marche, eighth King of the East, for memories of some of his early SCA experiences. He sent us this first installment with the note that it is written from memory and others may well remember events differently. I joined the SCA on October 31, 1969 at the Second Tolkien Convention in Green Bay, Wisconsin. I was living in Bowling Green, Ohio, at the time, and what I joined was the Middle Kingdom, at that time a small group in Chicago led by King (and later Duke) Cariadoc of the Bow. 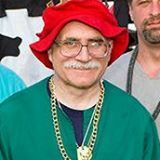 I went home and started the first SCA group in Ohio in 1970, the March of the Marshes, which later joined with a group in Cleveland to form the Barony of the Middle Marches, which has now devolved into several baronies. 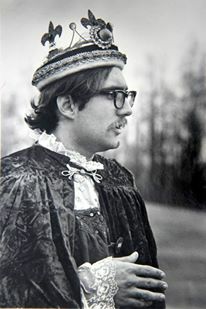 My first contact with the East Kingdom involved an event in Cleveland, Ohio in early May 1971. We had been negotiating by telephone for some time for a joint event, and a carload of Easterners came out for this one. They were delayed, so we fought the first part of the tourney outside — it was very cold for May, and there were even a few flakes of snow in the air. The winner of the Middle Kingdom portion of the tourney was Andrew of Seldom Rest (later Duke, now, alas, dead). When the Easterners did get there we moved inside; they fought a separate tourney among themselves, which was won by Rakkurai of Kamakura, and then he and Andrew met for the championship of the day, won by Andrew.